Black. Vigorous black. Called ‘Dark Night’, this exclusive and limited edition of 25 pieces only available in the U.S., is a watch of mystery and stealth that will be launched at the 2012 JCK show in Las Vegas. A unique ‘dark’ version of the iconic Girard-Perregaux world-timer, the ww.tc Dark Night features an imposing 43 mm black ceramic case. The severity of the case and its precise finishes underline the powerful black dial highlighted with touches of red and white. The tinted sapphire case back also discloses the movement behind its shadow. Beyond a mysterious black aesthetic, ceramic is not only one of the most durable materials in watchmaking, but it is also light and wearable. The sophistication of this structure is enhanced by the use of an internal titanium container. Rubber coated crowns, push buttons and a black rubber strap supplement its sporty characteristics. True to Girard-Perregaux principles, the ww.tc Dark Night stands apart because of its mechanism. 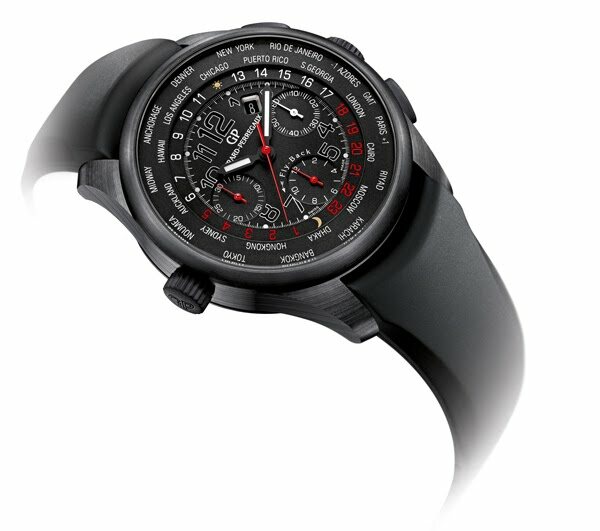 The Girard-Perregaux GP03387 self-winding movement, designed specifically for this model, displays the time in twenty-four time zones with day and night indicator, date and fly-back chronograph.